Lately, I've been thinking ahead to Christmas, so I decided to make a Christmas themed tag. 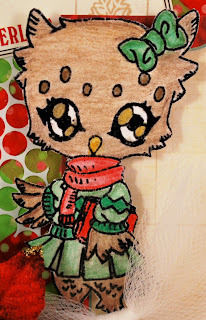 I used the new Owlee stamp from Queen Kat Designs by stamp designer Che Gilson. Such a cute stamp! To start the tag, I used two different washi tapes and simply crisscrossed them until the tag was covered. Then I added a bit of punchinella, patterned paper, ribbon, and a flower. Super simple to recreate. I stamped and then heat embossed the image. I knew I was going to cut out the image, and having it heat embossed seems to make it easier to cut around the edges. I used my Prismacolor pencils to color in the image. Her scarf makes this a perfect winter image!